Behind Gaza’s closed borders, where electricity runs an average of only six hours a day, a nascent startup community hums in isolation. At its heart lies Gaza Sky Geeks (GSG), the first and only incubator serving entrepreneurs in Gaza. Run by Silicon Valley-based humanitarian aid agency Mercy Corps, GSG aims to turn Gaza into a globally competitive tech hub by mentoring and fostering a robust community of startup founders and freelancers. In their latest initiative, GSG successfully crowdfunded enough to open a coding academy that will enable Gazans to secure remote software engineering jobs from across international borders. But that was only a first step. If GSG can secure an additional $7,000, they will launch a six-month program in which 30 young female refugees can learn coding and entrepreneurship, skills that women are traditionally discouraged from pursuing in Gaza. With support from an ever-growing list of industry notables, including Salesforce CEO Marc Benioff and 500 Startups Founder Dave McClure, every dollar given will be matched. Unreasonable spoke with GSG Director Ryan Sturgill about why investing in Gaza’s young women is more critical now than ever. What is your mission at Gaza Sky Geeks? R: Our mission is to transform Gaza into a globally competitive tech hub for online outsourcing, freelancing, and entrepreneurship. Why is GSG’s presence important for the community? R: GSG is leading the growth of the tech ecosystem in Gaza. Gaza’s developers and geeks are isolated because the borders have been closed for a decade. There’s strong internet and access to global resources online, but few local experts in software development and startups. We provide access to a global network of mentors and experts who bring best practices in tech and entrepreneurship to Gaza. At the same time, we work hard to build community among developers and entrepreneurs in Gaza to share knowledge and propel the ecosystem forward. What are the greatest challenges currently facing entrepreneurs in Gaza? R: Isolation, and more specifically few professional development opportunities to learn best practices in management, engineering, and knowledge of foreign markets. Electricity issues can be overcome, but there is little substitute for hands-on professional experience. Why is it critical to invest in Gaza’s tech sector? R: Tech is Gaza’s lifeline to the world. It is the one sector not subject to the fluctuations in borders and security. Customers are abroad, the product is in the cloud. If people can code, they can support a whole community. Gazan developers are in demand, fully employed, and earn some of the highest salaries here (12x per capita GDP and up). Congratulations on hitting your initial crowdfunding target! What will the new target dollars be directed toward? R: We want to launch a coding academy to train developers how to build globally competitive, relevant products but also essential tools for lifelong learning and skill building. What do you hope the future of Gaza’s young women will look like as a result of GSG’s work? R: We hope more women get involved in tech and launch careers in freelancing, startups, or outsourcing. We want women to feel confident and supported through our community, mentorship, and education, and we see that building products and leading teams, and learning how to code, has huge benefits across the board for young girls, female founders, and their families. 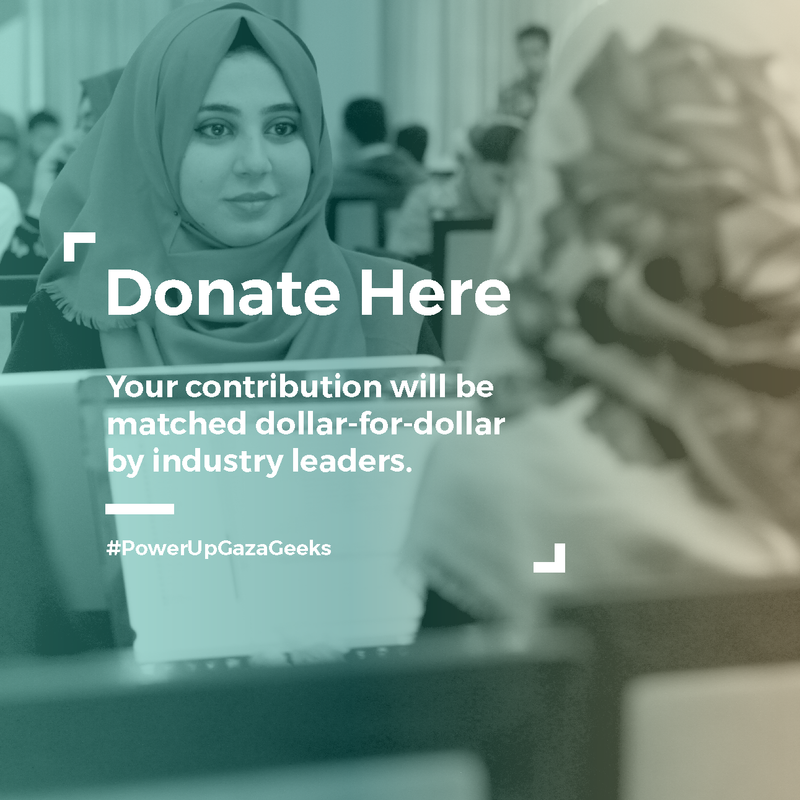 Contribute to the Gaza Sky Geeks crowdfunding campaign, where every donation will be matched dollar-for-dollar by a growing list of industry notables, including Salesforce CEO Marc Benioff and 500 Startups Founder Dave McClure. Apply to mentor startups in Gaza. GSG is especially interested in technical mentors and product managers who can come to Gaza for at least a week, but ideally for a month. Spread the word about the power of technology to cross Gaza’s closed borders. Volunteer, especially if you have specific expertise in online payments and banking – areas that many entrepreneurs struggle with in Gaza.